Nov. 23, 2016 -- The 2010 explosion on the Deepwater Horizon Macondo oil well drilling platform triggered a massive oil release polluting over 1,300 miles of shoreline along the Gulf of Mexico. The harm from the spill to coastal salt marsh habitat was extensive, and in some instances, permanent. Because birds, fish, crabs, shrimp, oysters, coastal dolphins, and other wildlife depend on the Gulf’s salt marshes, any loss or degradation of this habitat has broad implications for the ecosystem. Harm to coastal salt marshes Oil can affect animals and plants through chemical toxicity and physical smothering. More than 687 miles of coastal wetland shoreline were polluted with oil throughout the Gulf during the 87-day spill. The injury assessment team used field and laboratory studies to demonstrate that oil degraded the health of coastal marsh plants and animals, reduced nearshore oyster cover, and increased erosion of oiled marsh edge habitat. The amount of oil along the shoreline (and how long it stayed there) was the most useful indicator of harm to nearshore organisms, while plant stem oiling was the best indicator of loss of vegetation. Activities to clean up oiled marshes (like flushing with water or raking to remove oil) delayed marsh recovery and exacerbated the loss of oysters, though it was not always possible to separate effects of oiling from effects of response actions. 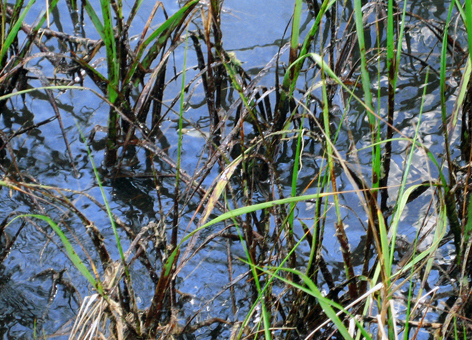 Salt marshes in Louisiana were most intensively polluted by the oil spill. At least 350 miles of coastal marsh shoreline in Louisiana was injured. Even trace oiling of plant stems in Louisiana salt marshes reduced plant cover in the marsh, and affected plant growth, particularly in the marsh edge zone closest to the shoreline. The marsh edge is most productive zone because it provides migrating animals access to flooded marsh surfaces for refuge and foraging. 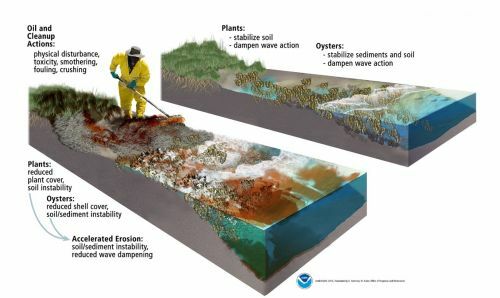 Oil damage to plants and oysters, as well as oil clean-up measures (see graphic), increased the erosion of marsh shorelines between 2010 and 2013. Increased erosion of oiled vegetated shorelines is estimated to have occurred over at least 108 miles of shoreline throughout the Gulf. Marsh recovery is expected to take more than 10 years for long-lived species such as periwinkle, while eroded shoreline has been permanently lost. All data collected as part of the Deepwater Horizon NRDA are available online. Read the full study “Integrated effects of the Deepwater Horizon Oil Spill on Nearshore Ecosystems” in the scientific journal, Marine Ecology Progress Series. Mary Baker is the OR&R branch chief for the Northwest and Great Lakes.